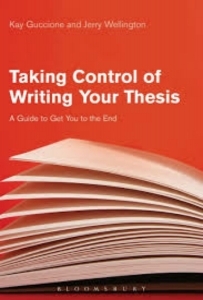 In Taking Control of Writing Your Thesis: A Guide to Get You to the End, Kay Guccione and Jerry Wellington provide doctoral students nearing the end of their dissertations with a practical guide to taking charge of their thesis. Abha Rai strongly recommends the easy-to-read, conversational style of the book and its approach to real-world challenges to all doctoral students looking for writing support. Taking Control of Writing Your Thesis: A Guide to Get You to the End. Kay Guccione and Jerry Wellington. Bloomsbury. 2017. Kay Guccione and Jerry Wellington stay true to the title of their book, Taking Control of Writing Your Thesis, until the end. From the very first until the very last chapter, the authors provide numerous examples of impediments that may cross your path as a doctoral student. But the book exactly reflects the authors’ sentiments that ‘they don’t intend to put obstacles in [the students’] way without acknowledging that they can be overcome with some considered thinking and planning’. The main objective of the book is to provide doctoral students who are nearing the end of their doctoral journey with a practical and easy guide to take charge and control of their thesis. The easy-to-read and conversational style of the book will definitely draw readers to it. Writing and publishing are seen as the biggest ‘currency’ in academia. Doctoral students across disciplines are pressured to write as this may be one of the only ways in which they may be deemed ‘productive’. However, this pressure to be ‘productive’ without a defined pathway may increase stress among doctoral students. The simplicity and practicality with which Guccione and Wellington deconstruct the process of writing for doctoral students really stood out for me. Furthermore, doctoral students struggle to manage their time and face imposter syndrome, difficulty with words, a lack of commitment and self-doubt. This book in my view is a good step-by-step guide to conquering these fears and engaging in effective writing, time management and the overall organisation necessary for an advanced doctoral candidate. The simple tactics from the authors, such as finding the right spot to write, setting goals and realistic timelines, seemed refreshingly useful. The more I read this book, the easier it has been for me to acknowledge the fears and the challenges I face and eventually believe that I don’t have to be terrified of my dissertation. The most important suggestion about writing that resonated with me was to include it within a daily or weekly schedule and not wait for the ‘right time to start writing’. Often, in an attempt to carve out the perfect manuscript or dissertation chapter, doctoral students wait for the ‘right time’ or the ‘ideal day’ to start writing. However, in all practicality and honesty, trying to find this ‘right time’ is a rather tedious and almost impossible task. Therefore, building in some daily writing time (about 30 minutes) allows for constant progress and minimises the risk of procrastination. Real-world challenges, such as the difficulty in articulating one’s thoughts, lack of support from one’s advisor and being isolated in the doctoral journey, are extensively discussed by the authors. What I liked most was that each of these was deconstructed for students with solutions that could be effectively applied to overcome difficulties. For example, Chapter One focuses on the various facets and intricacies of the relationship between a student and advisor and how boundaries can be set as a foundation for a productive relationship. They advise establishing clear expectations with the dissertation chair or supervisor, along with having a road-map for achieving those. The authors also go a step further by providing templates and specific language that can be used by students to contact their advisors. Utilising these can be a good starting point for doctoral students who are struggling with issues pertaining to their supervisors. Chapter Two discusses various writing milestones that students can set in order to move forward with their writing. Setting these markers is particularly important for doctoral students as they tend to feel isolated and sometimes experience self-doubt during their doctoral journeys. Having specific milestones attached to well-mapped timelines, as the authors suggest, will be advantageous to students by enabling them to stay organised. The parallel process of reading and writing that the authors discuss in Chapter Six will also be especially helpful for doctoral students starting to organise their writing schedule. The critical questioning techniques that the authors provide throughout their book, and more specifically in Chapter Six, will prove useful in linking the research to the writing, which is often a challenge for doctoral students. Continuing this review without sharing the influence of this book in my personal work will undermine its utility. Therefore, I will reflect on some of the ways I implemented the suggestions made by the authors. I can vouch for how many times as a doctoral student one hears the question: ‘Why can’t you just get your dissertation done?’ When colleagues known to me were asked this question – even by me a few times – little did I know the challenges of getting ‘it’ done. Being in the same spot now, I realise the pressures, apprehensions, fears and difficulties one may have about getting down to writing. This book has come in handy in many such times of uncertainty that I have faced. I read this book about six months ago for the very first time, and have been skimming through it ever since, re-reading certain parts that seem relevant to me. I use this book as a point of reference almost every time I get ‘stuck’ with writing or am overwhelmed with my schedule. I first started reading this book around the time I was taking my qualifying exams for my own doctoral programme. In close adherence to what the authors propose, I first developed a writing schedule and a plan for writing before actually beginning the exam. 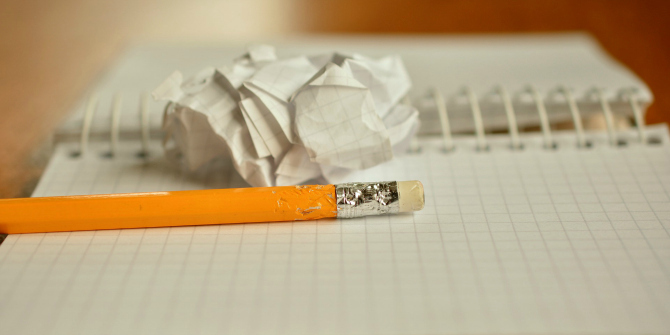 The writing schedule helped me stay focused, because I knew that there was no reason for me to get overwhelmed or stressed. If I stuck to my plan, I would be able to easily accomplish my writing goals for my exam and allow for sufficient time to review my work. After my qualifying exams, when I started working on my dissertation proposal, I found the instructions and steps generously provided by the authors helpful in structuring a competent proposal. Their step-by-step process allowed me the opportunity to break down building a proposal into manageable micro-milestones. Therefore, overall, I believe that the book is a reference guide that can be used by doctoral candidates in any field and at any stage of their journey. I would go further and suggest that if this book were made available to doctoral students just beginning their studies, I believe it could positively impact their productivity and writing style. Using this textbook as a reference guide will allow doctoral students to stay reflective and focused, while also finding ways to receive the validation they need through the practical approach followed by the authors. The blogs, social media platforms and other resources that the authors provide in the book are free and can be utilised by all doctoral students looking for any sort of writing support. The strategies for organising writing retreats and online writing groups are manageable and can most definitely be initiated by doctoral students. Overall, I strongly recommend this book to all doctoral students and even to early career professors. Following the suggestions made by the authors will certainly allow doctoral students to take control of writing their thesis and get it done. Abha Rai is a current PhD candidate (ABD) at the University of Georgia, United States. She has over 12 years of extensive experience working with community-based organisations both in the US and India. She identifies as a feminist scholar and primarily focuses on domestic violence issues among South Asian immigrant communities residing in the US. She enjoys conducting both qualitative as well as quantitative research.